have been established in Dunedin since the late eighties and have enjoyed enormous popularity not only locally but throughout South, Central and North Otago. They have built up a reputation for being professionally entertaining and for knowing what they are doing. City Slickers are run by private function Disc Jockeys who have had simply years of experience and pride themselves at being able to 'read the crowd' 95% of the time (nobody’s perfect!). The DJ’s are familiar with music from the 60’s, 70’s, 80’s, 90’s and up to present day, whether it be Pop, Rock, Country, Reggae, R & B, Hip Hop, House etc. Geminic City Disco is the top of the range disco rig. The lighting consists of laser lights, effect lights, dual mirror balls, sound activated lights, colour wash lights and smoke machine. These lights are used tastefully to suit the occasion and the atmosphere of the night, usually a slow build up at the start of the evening to a lighting extravaganza later on and, obviously, the lighting is controlled to whatever music is being played. This disco is only operated by the most experienced DJ’s. 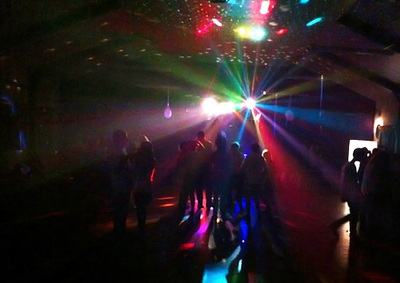 Aquaria City Disco is the second in line and, although this disco has reduced lighting effects and slightly less powerful audio than Geminic City, this is still a big unit and we would advise which disco would suit your needs as some venues do require a more powerful unit to have a comfortable sound. Again, this disco rig needs to be operated by an experienced DJ. Bucky's Rodeo Disco can be booked for a country/western themed party either on it's own or in conjunction with booking 'Bucky the Mechanical Bull'. The speakers are covered in cow-hide material, the lighting effects are draped on horns and the DJ looks the part in his cowboy outfit! The music will have a 'country flavour' throughout the night, but still catering for other tastes as well. For something different, have yourselves a YEE-HAW night! 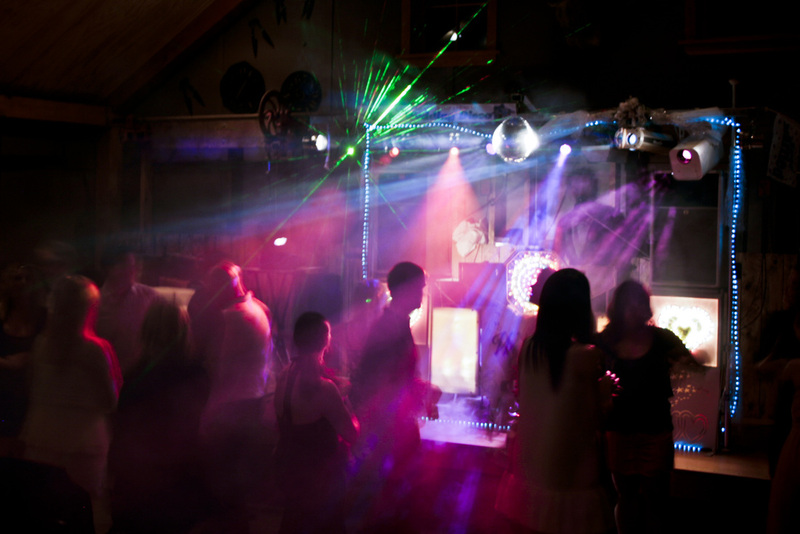 The Wedding Disco is the only one of its kind in New Zealand. City Slickers are doing more and more weddings each year, with most of their business coming from referrals and future couples experiencing the wedding party receptions that hire them. Because of that, in 2007 they decided to create and build The Wedding Disco which specialises in weddings.This classy disco uses tasteful lighting with a minimum and maximum lighting effect, using the two most experienced DJs wearing their City Slickers 'tuxedo' shirts which get compliments wherever they go (one of the DJs was offered $150 for his shirt at a wedding in Wanaka - no, he did not sell it!). 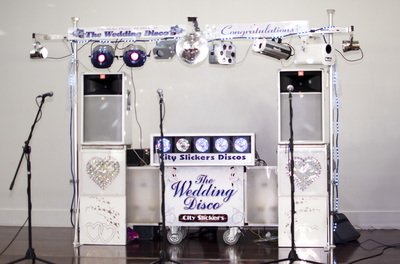 This disco is all in white and silver with a touch of blue - perfect wedding colours and obviously wedding orientated. When booked for a wedding, the DJ will call the Bride & Groom during the week before to discuss the music, including their choice of wedding dance song, and a time for him to set up at the venue before the guests arrive (sometimes this is not possible if the function is out of Dunedin). On the night, he will play cruisy music until the Bride & Groom are ready for their first dance and then he will introduce the newly-married couple onto the dancefloor whilst encouraging the guests to clap and cheer to their hearts content. The DJ will then bring on the wedding party (bridesmaids, groomsmen, etc.) at a particular point in the song or, if the couple desire to dance on their own for the entire song, so be it! It’s your day and the DJ will do everything he can to make it a night to remember. He will take requests and play them at the right time but, most importantly, he will play music to cater all age groups at a comfortable volume. The music is continuous throughout the night and, of course, will stop for speeches and announcements when requested. City Slicker DJ’s do not carry song lists as these are only needed by 'bedroom' DJs who are not sure what to play. You are paying for the experience of a DJ to know what he’s doing and, apart from that, City Slickers have thousands of songs too numerous to list. The DJs are also trained to speak clearly and effectively on the microphone, not shove it down their throat to produce a muffled noise that resembles somebody being suffocated with a pillow! The duration of the function is discussed at the time of booking, although 4 hours (or part thereof) is the standard. If you want to party longer, this can be negotiated with the DJ on the night. Sometimes a school function/fundraiser have limited budgets and special deals can be arranged in these circumstances. Being Sole Agents to Twilight Entertainments, no deposit is required. In the event of cancellation at any time within 30 days before the function, the DJ shall be entitled to be paid a cancellation fee of an amount equal to the full fee as agreed. Travelling expenses are charged for functions out of the Dunedin area and, in some cases, accommodation may be required. City Slickers will ensure that your night is a huge success. Whether your function is a small party for 40, or a black tie corporate function for 300, City Slickers can provide you with a mobile disco to suit your exact requirements.